A drawing of birdsong and piece of writing about it were published by Psykick Dancehall up in Glasgow at the end of last year. It’s a bit of a meditative memory exercise in response to one of long list of questions posed by Dancehall. See below or here in published context; the text layout and way it interacts with other contributes is worth seeing. Recount a family anecdote that the sounds you are hearing now put you in mind of. Not so much an anecdote but a sense of place and sounds where family is. I am listening to and drawing bird sounds in my parents garden. 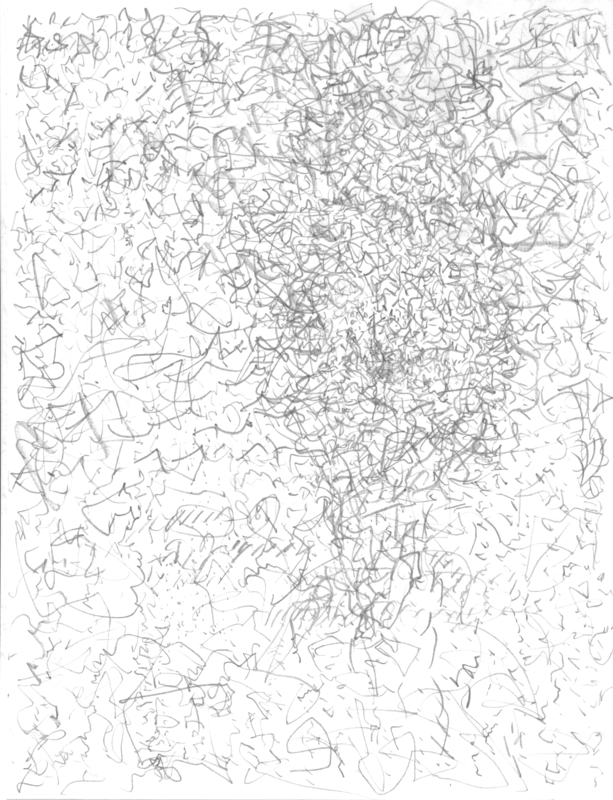 The idea of drawing sounds is inspired by work I’ve done in the last year or so with Naomi Kendrick and Dan Bridgwood-Hill. Dan and myself improvise and Naomi draws what she hears on huge sheets of paper; it works as a really exciting process for us all, working collectively across implied boundaries presented by form. It’s made me think differently about the possibilites of sound, drawing and mark making and led to situations like the one now: I’m actively listening to my surroundings and drawing as automatically as possible what I hear. Hearing some of these birds and sounds again and pencil scrabble as I try to keep up with the pace and rhythms flying in from all sides; the mixture of turn taking and intuitive entry and re-entry into the overall soundscape fascinates me, with so many individual voices present, there is much more listening going on than actual vocalising; a vital part of collective music making. I stop drawing once enough layers of memory are present in the density of the pencil marks.